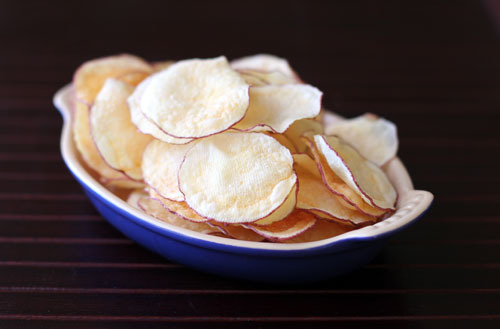 I’ve done a few recipe roundups for Cosmo featuring chips of all kinds. 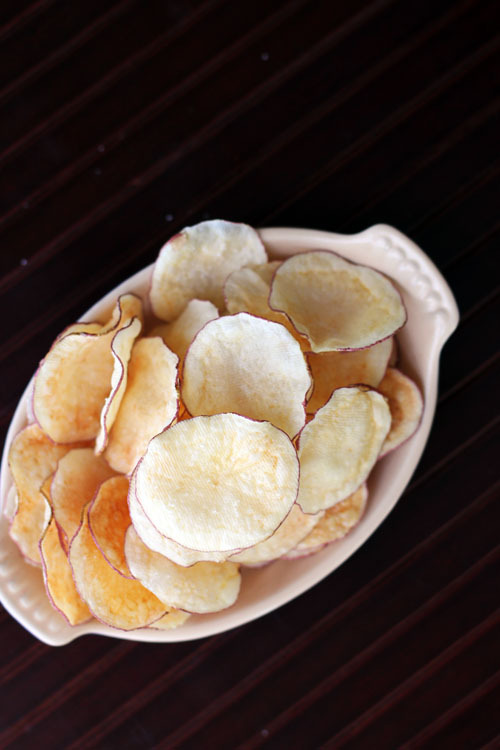 While digging around the web looking for chip recipes, I discovered a tip that I had never known before – you can use the microwave to make chips! I couldn’t believe it. No matter how many blog posts or articles I read about the technique, I just didn’t think the microwave would actually work for making chips. Of course I had to give it a try and, I am here to attest, that this trick works beautifully! You don’t even have to use oil, making these chips healthier than the traditionally fried (or even baked!) variety. The chips come out really light and crispy. My family loved them, especially Nate and Cate. Nate couldn’t believe they were homemade, let alone cooked in the microwave! You can pretty much use whatever kind of potatoes you like, and you can even use other vegetables, too. I saw plenty of microwave chip recipes out there using foods like sweet potatoes. I haven’t tried anything but potatoes myself, but I think I might have to! One more quick note: the process is a little time consuming. It takes a few batches to cook one potato but, while it takes a little time, the process is incredibly easy. Just have a book or a podcast handy while you are cooking! 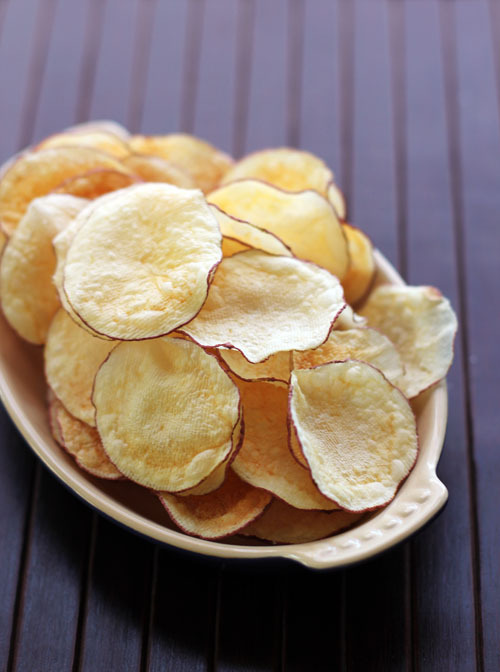 Believe it or not the microwave is the secret to making perfect potato chips at home! Slice one small potato very thinly. You do not need to peel the potato first, although you can. 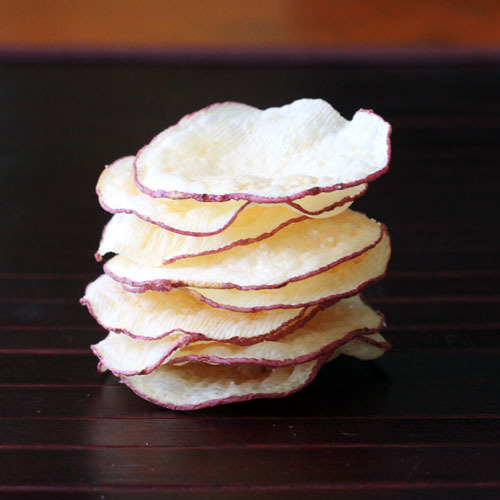 Use a mandoline to get very thin, evenly-sliced potatoes. You can also use a sharp knife, it will just take some patience and a little more time. As you slice the potatoes, put them directly into a large bowl of water. Once the entire potato is sliced, drain off the water, refill the bowl with water and let the potatoes soak for about 5 minutes. Keep the potatoes in the water until it’s time to cook them. Cut a piece of parchment paper to fit the size of the glass tray in your microwave. Place the parchment paper directly on the glass tray. Place a few paper towels flat on your counter. Remove some of the potatoes from the water, place on the paper towels, and dab dry with another paper towel. Spread potato slices evenly on the lined microwave dish, so that they are not touching. Sprinkle evenly with some salt. Repeat the drying and cooking process until you’ve used your entire potato, probably about 3 batches total. You can reuse the parchment paper for each batch. If the paper starts to curl, just flip it over between batches. I slice mine a little thicker, toss in a bowl with olive oil and course salt. Spread on cookie sheet turning half way through. 350° for 30 minutes or more. I like mine crispy so I bake them a little longer than recommended. Thanks, Jane! This is a GREAT tip! Can’t wait to try it when Greta and Glenys visit in July. Hugs! I bought a little contraption that requires you to stand the thinly sliced potato vertically in a circle in slots in this contraption and microwave. Good idea but i was wondering if i could find something plastic as big as the glass plate in my microwave i could cut slots into it and cook the chips a bit faster and maybe a whole potato or more at a time. I seriously had NO idea you can do this in a microwave. So cool!!! I know, right?!?! I had no idea either, it’s so crazy! Its the sugar in the potato that cooks the chips. This is GENIUS. Love it. wax paper is safe for the microwave and should work. I would make sure to use one of them, though, because the potatoes would probably stick to any other surfaces. parchment is ideal. good luck! Awesome! This is the best thing ever. Thank you so much for making my life healthier and more fun! that is so clever – great trick!! thank you! let us know how it goes! good luck! Sorry… I forgot to say bake in the oven. It gives them a fabulous flavor. Y para los que sÃ³lo hablamos espaÃ±ol ???? No podemos hacerlas… es triste. I made these, and I was so pleased! The only problem I found that I had to microwave the potatoes for 5-10 minutes longer than you did on high in the microwave. I don’t know why that was the case, but it might’ve happened because I used golden potatoes and I sliced them with a knife, and I couldn’t get them very thin. Other than that, the chips were delicious! I’m so happy I found this recipe!!! I’m sure it’s just the wattage on the microwave – all microwaves are different, sounds like yours may be a little less powerful than mine. the thickness also probably played into it! but I’m glad you were able to add time and still have them work! yay! awwww, that makes me so happy! you’re welcome! No to the foil – metal cannot go into the microwave. I would put wax paper or parchment paper on your list for your next trip to the store. you could maybe try on a plate or paper towel, but I am worried they will stick as they cook. the waxed paper or parchment really do help a lot. SpinPing » » 16 Awesome Recipes You Can Make…In The Microwave? Pure Genius!